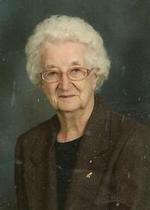 Wilma L. Leibolt, age 86 of Ashland, OH., passed away Thursday, July 14, 2011 at Crystal Care Center of Ashland. On November 11, 1924 in Ashland, Ohio, Mrs. Leibolt was born to Gerald and Bernice Lindecamp. She had been a resident of Ashland all of her life being employed as a waitress for 31 years at Perkins Restaurant. Mrs. Leibolt was a member of Calvary Baptist Church in Ashland. On April 8, 1945 Mrs. Leibolt married John Leibolt who preceded her in death on November 25, 1992. She is survived by one son, Jerry (Becky) Leibolt of Polk, OH. ; one daughter, Judy (Clarence) Smith of Greenwich, OH. ; 10 grandchildren; and several great-grandchildren. Mrs. Leibolt was also preceded in death by two brothers: Dale and Kenneth Lindecamp and a granddaughter.